Olive oil spread : easy to make, healthy to eat. Home made olive oil spread - delicious, nutritious and easy to make! A delicious alternative to processed spreads, this olive oil spread recipe is healthy, inexpensive and easy to make. We tell you why and show you how. Why olive oil spread and not butter? 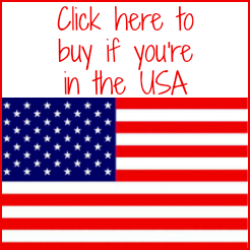 Why not just buy it? Isn't it a little bland? 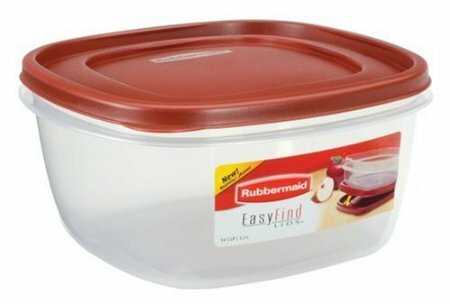 One small freezer-proof container - we use a little tupperware box with a sealing lid like this one. One bottle of the best olive oil you can possibly afford. We're lucky - we use our own extra virgin, cold pressed oil which has a gorgeous peppery flavour. 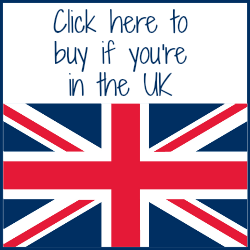 To see how to choose a good quality oil, have a look a this page. It will open in a new window so you can easily come back to this recipe page. Take your freezer-proof container and your bottle of olive oil. 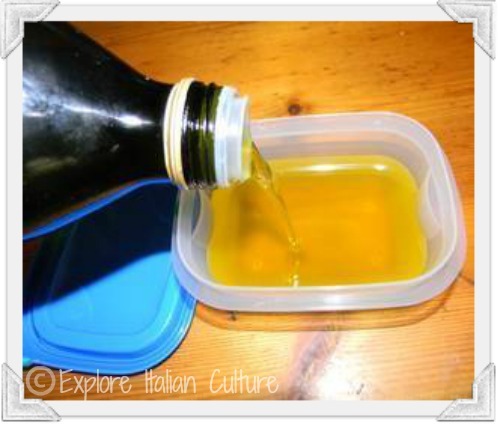 Pour the olive oil into the container until it's almost at the top. Seal and put into the freezer for at least 24 hours. Take it out and use it! Top Tips for our olive oil spread recipe. 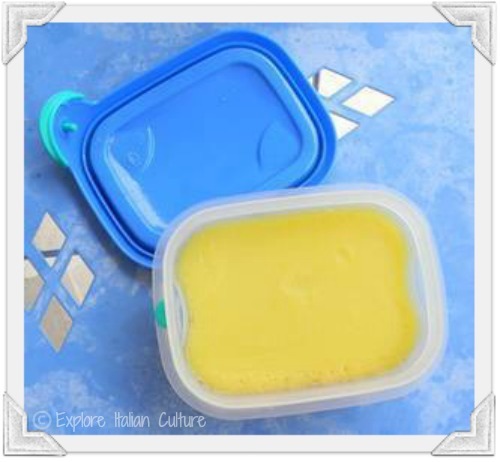 Don't leave the spread out of the freezer for very long - it will start to return to its liquid form quite quickly - especially in the heat of an Italian summer! We love eating our spread simply, with some good crusty bread. Our own oil always tastes delicious - it has an unique, peppery taste - but even it starts to lose its flavour after ten months or so. Oils bought from the supermarket are generally even older than this so, if you find the taste too bland, do what the Italians do - add something to it! One of the favourites is simply to sprinkle a little salt on top. This is our very favourite - delicious! Don't add salt to the oil before you freeze - not everyone will want it salted. Add some crushed garlic or finely chopped basil or oregano to the oil before you freeze it. If possible use fresh herbs rather than dried - they are a much better flavour. Buy the ingredients necessary to make olive oil spread. Extra virgin Italian olive oil. 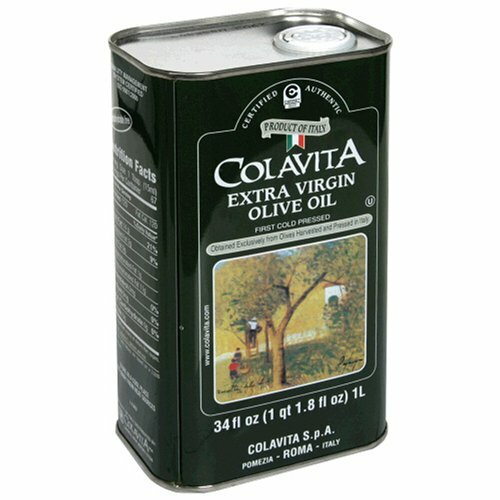 This is a good quality oil imported from Italy. It's first cold pressed and amongst the best you will get outside of Italy. Olive oil is an important part of creating a healthy diet, the Mediterranean way. Want to know more? 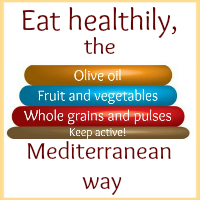 Click the picture below to go to our pages about the Mediterranean diet and learn how it can help keep your family healthy.